It a 24 multi colored roses, beautifully arranged in a vase. Send this to your loved ones as a gift on a special occasion and let them depict that how much you love them and miss being there on their special moments. 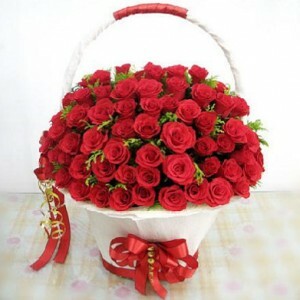 Send this 50 Multi Colored Roses basket, to your loved one and make them realize that you are nuts about him/her and express those unsaid words -? ?you mean the world to me? 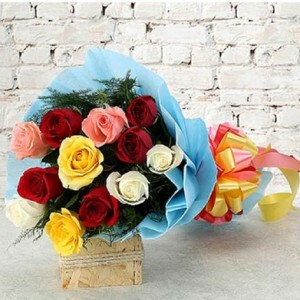 A bouquet of multi colored roses with green fillers beautifully wrapped with a bow on it. Its perfect to show your feelings. Send this to your loved ones in Pakistan. It also includes a free beautiful and very expressive card. -Delivery possible to Karachi, Lahore, Islamabad & Rawalpindi in 48 hours. -Flowers may vary, depending upon availability. 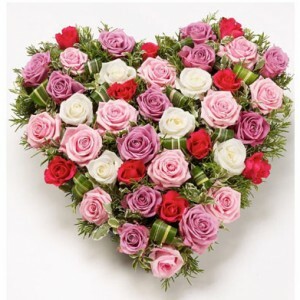 A beautiful heart shaped arrangement of 50 Multi Colored Roses. This special gift can be enough to show your love to someone. -Delivery possible to Karachi, Lahore, Islamabad, Peshawar & Rawalpindi with 2-3 days notice. Small bouquet for big moments. A fragrant spray of flowers when you just want to say you care to that special someone in your life. Wrapped in clear plastic adorned with a ribbon. Approx 8-10 multi colored flowers with green filling. Send a bunch of imported Daisies, whether you are celebrating a specific event or just because. This bunch includes 8 stems of Daisies, beautifully arranged and wrapped. -At least 2-3 working days required for the delivery of this product. -Delivery possible to Abbotabad, Bahawalpur, Faisalabad, Gujrat, Gujranwala, Hyderabad, Islamabad, Karachi, Lahore, Multan, Peshawar, Quetta, Rawalpindi, Sahiwal, Sargodha, Sialkot, Sukkur & Wah Cantt. An exclusive arrangement of 50 Red and Pink Roses in a Heart Shape. This special gift can be enough to show your love to someone. 1 Dozen Imported Red Roses. Whether you are celebrating a specific event or just because, this is the perfect gift! One dozen of our long stemmed imported roses mixed with exotic imported fillers. Send a bunch of imported Carnations, whether you are celebrating a specific event or just because. This bunch includes 10 stems of Carnations, beautifully arranged and wrapped. This package also includes a free beautiful and very expressive Greeting Card. -Delivery possible to Abbotabad, Bahawalpur, Faisalabad, Gujrat, Gujranwala, Hyderabad, Islamabad, Karachi, Lahore, Multan, Peshawar, Quetta, Rawalpindi, Sahiwal, Sargodha, Sialkot, Sukkur & Wah Cantt. -Product can be slightly different from the picture. Send a bunch of imported flowers, whether you are celebrating a specific event or just because. This bunch includes 5 stems of Daisies and 1 Lily, beautifully arranged and wrapped. Send a bunch of imported flowers, whether you are celebrating a specific event or just because. This bunch includes 4 large stems of Lilies (approx. 12-14 buds), beautifully arranged and wrapped. -Deliverable to all the major cities of Pakistan. Send a bunch of imported Orchids, whether you are celebrating a specific event or just because. This bunch includes 10 stems of Orchids, beautifully arranged and wrapped. This package also includes a free beautiful and very expressive Greeting Card. It is the one they will never forget! One dozen imported Multi Colored Roses. Whether you are celebrating a specific event or just because. This is a perfect gift ! -Colors may vary depending upon availability. 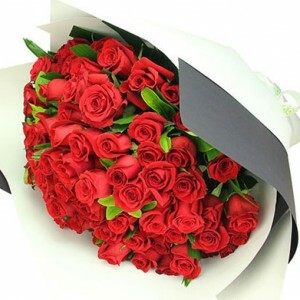 Send a bunch of imported flowers, whether you are celebrating a specific event or just because. This bunch includes 7 large stems of Daisies and 2 Lilies, beautifully arranged and wrapped. Send a bunch of imported flowers, whether you are celebrating a specific event or just because. This bunch includes 6 large stems of Lilies (approx. 15-18 buds), beautifully arranged and wrapped.